According to the US Department of State, anyone under the age of 16 is classified as a child and only qualifies to receive a passport book or card valid for five years. Under this system, assuming the parents start traveling with their child early, someone can hold three (or more, if lost or stolen) passports before he or she turns 16. Every time a parent is applying for a passport for their child, whether it’s the first time as a baby or a renewal at age 12, they must use Form DS-11, the same for adult passports. In addition to this, evidence of the child’s US citizenship, proof of the relationship with the parents, the parents’ IDs (passports are acceptable), photos (age progression in the case of a renewal), and fees must be provided with the application. Where does Form DS-3053 fit in? must be included as part of that application. Both parents or legal guardians must authorize the US Department of State to issue their child’s passport by appearing in person with the child at a regional passport office. However, because we live in a modern world, with children with only one parent, no parents (emancipated), one parent who may not be able to appear with the other, etc., the State Department allows for exceptions to be made provided the appropriate paperwork is included. 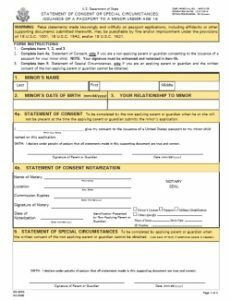 Form DS-3053 allows for one parent to appear in person with the child for their passport application, provided the other has completed the form giving their approval for a passport to be issue in their child’s name in front of a notary public with their ID. Therefore this form isn’t so much a necessity in applying for a child’s passport as much as a statement of consent if one parent cannot appear. This form may also be used if neither legal guardian is able to appear to apply for the child’s passport. Both must fill out the form in front of a notary public with their IDs and authorize a third party – like Travel Visa Pro – to apply on behalf of their child. If the child has only one legal guardian who is unable to appear, proof of this must be submitted along with a copy of Form DS-3053. If only one parent or legal guardian can appear, but he or she happens to have sole legal authority of the child, evidence of this must be presented with the passport application, e.g. a court order granting the parent sole legal custody of the child or one specifically permitting the individual to apply for the child’s passport. Other documents may be submitted for cases including the death or legal incompetence of one parent. 1. Consider how old your child is. Both children under 16 and those between 16-18 may use Form DS-11 when applying for a new passport, but children under 16 must have the approval of both parents or legal guardians, barring the aforementioned exceptions (Form DS-3053). 2. Applications for children’s passports can only be made in person at a regional passport office or a US embassy or consulate. Please make an appointment when necessary. Third party agencies like Travel Visa Pro can process your child’s passport on your behalf with a copy of Form DS-3053 from both parents. 3. Bring the child, both parents, the parents’ IDs and copies, Form DS-11, evidence of the child’s US citizenship, proof of the relationship with the parents, and photos (age progression in the case of a renewal) to the consulate or passport office. 4. Payment varies. A $25 Execution Fee is required at regional passport offices in addition to the $80 processing fee. Expedited service is available for $60. 5. Wait until your passport is returned by mail, or ready to be picked up. 6. Start traveling with your child!